` We often get telephone calls and email inquiries from customers and dealers asking if we finance bad credit swimming pool loans. This is a very general question that often times require us to answer the question with a question: What is your definition of bad credit? Credit scoring models and data that carries weight on scores has changed a lot in recent years. What used to be beneficial to your credit often times can have little or no effect on scores such as a co-signer on a credit card that has impeccable credit. This used to be a loop hole in the scoring model that has since been closed by the 3 major repositories. Medical collections are often looked at as having no effect on credit to some lenders. Credit inquiries can be confusing to some consumers as there is a lot of people that think each one counts against your scores and this is not always the case. The bureaus let you have some leeway when you are shopping for a car , mortgage or swimming pool loans. Multiple hits within a few weeks from the same category doesn’t count against you nearly as much as you think and sometimes not at all. So, back to the original question, do we finance bad credit swimming pool loans? Yes is the answer. 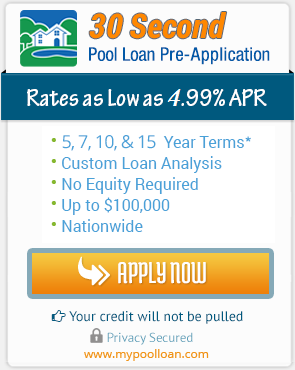 We finance a lot of pool loans for people with bad credit. It takes a trained eye and a skilled credit analyst to read between the lines and find creative ways to get the bad credit pool loans approved. We have seen loans with scores below 500 get approved and pool loans with collections and liens get approved as well. I would advise anyone that thinks that they have good, bad or questionable credit talk to a representative to see how your situation allow us to get your loan approved and your new swimming pool project or remodeling job started. Don’t assume that you don’t qualify before speaking with a trained professional. Pool financing is certainly possible with bad credit. Happy swimming!